Five-time NBA champion Kobe Bryant scored 60 points in his final game as he ended a glittering 20-year career with the Los Angeles Lakers. It was the sixth time the NBA's third highest scorer had scored 60 points, beaten only by Wilt Chamberlain. "You can't write something better than this," said 37-year-old Bryant, who helped the Lakers come from behind to beat Utah Jazz 101-96. 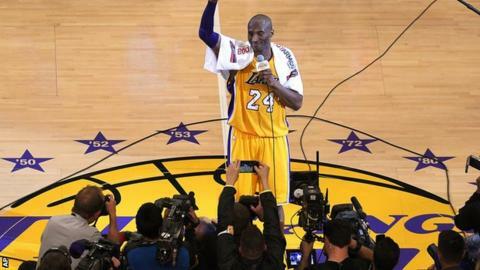 Basketball fans paid up to $27,500 (£19,315) to see Bryant's final game. He attempted 50 shots on the night, the most by anyone in an NBA game in the last 30 seasons. Bryant led the Lakers as they overturned a 20-point deficit at half-time, scoring 23 points in the fourth quarter of his 1,556th game with the team. Bryant, who made his debut in November 1996, finished with 33,643 career points - third on the NBA's all-time scoring list behind Kareem Abdul-Jabbar (38,387) and Karl Malone (36,928). The 18-time All-Star, known as the 'Black Mamba,' told the crowd: "I can't believe how fast 20 years went by, this is crazy. "What can I say? Mamba out." Bryant, who was voted Most Valuable Player in 2008, the same year he won the first of his two Olympic gold medals with the United States, added: "To carry on the legacy and tradition of all the great Lakers that came before - it's unfathomable. I can't express what a dream this is. "I gave everything I could to the game, that's why I'm so comfortable walking away. I bared my soul to this game, I left it all here." Reflecting on his final game and a remarkable comeback that produced a fairytale victory, Bryant continued: "All night long my team-mates were just continuing to feed me the ball, I just had to take the challenge. "I was just like, 'OK, I've got to settle down'. Defensively I got some plays - I got some steals, I got a block - and that kind of got me into the game a little bit." Lakers legend Magic Johnson had earlier told the crowd: "He never cheated us as fans. He has played hurt, and we have five championship banners to show for it." US President Barack Obama joined in with the tributes, tweeting: "farewell for an all-timer".